The beautiful and talented Kayla from Not Your Standard is a gorgeous half Italian-half Chinese fashionista from Canada and living in Berlin. She lives and breathes fashion and started her blog as a way to share a certain standard of living. I have been admiring Kayla's page for quite some time and had to share her sense of style. 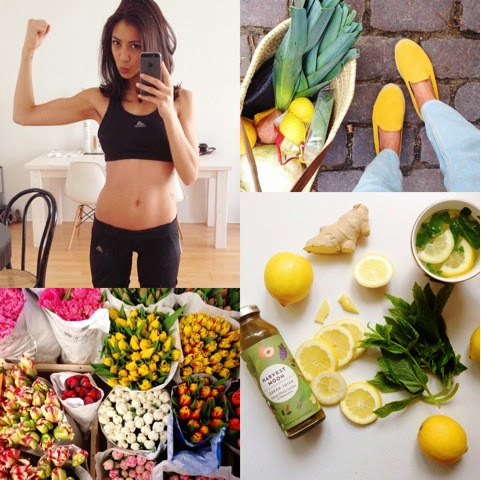 Fitness, Food and Flowers just go hand in hand, don't they? "Don’t over do it, less is more most times – stick with pieces that hold great shape, I find those pieces to be my most coveted ones." I work out 4-5 times a week, a combination of strength training and running. I find with having such a busy schedule I must find the time to exercise to keep my sanity. When I’m at the gym it’s my only time I can really focus on that moment instead of thinking of what to do next and tackling my to-do list. Quinoa with roasted sweet potatoes, beets, caramelized onions, walnuts and smoked tofu drizzled with a home made spicy sesame sauce. I have always admired Christine Centenera, fashion editor at Vogue Australia. She wears structured pieces and is effortlessly chic, I dream of her shoe closet. Punctuality. I’m so glad my Mum taught me how important that trait is. It’s significant in everything you do in life. Phone - I am an Instagram addict, my homemade granola bars and sunglasses. Thanks so much for joining us Kayla and sharing your styling tips with us.